People buy at auction for lots of reasons, they might want to move quickly or they could be looking for a repossessed property, a plot of land to build on or quite simply they want a quick purchase without the risk of gazumping. They may also want something a bit unusual, the type of property not usually sold traditionally through an estate agent. Buy-to-let investors also buy properties at auctions, as they have a full range of investment opportunities to choose from and they can purchase quickly. It doesn't matter what your reason for buying at auction is, the key to success is preparation. Before you go along to an auction to buy a property there's a lot of groundwork that needs to be done first. A good place to start is by making a list of your 'must- haves'. It could be a particular location, detached or semi-detached, number of bedrooms, price range, space for parking, etc. Once you have an idea of what type of property you want to buy, then you're ready to start your search. There are lots of places you can start looking, the Internet, property supplements, regional and local papers and by contacting auction centres. The auction centre can add you to their mailing list and you will be sent a copy of the auction catalogue which lists all of the properties for sale. You'll be one of the first to see it and it will give you plenty of time to complete your enquiries before the auction. Some of these preparations will incur costs, but it's much better to make sure everything has been checked in advance for your own peace of mind. The auction centre will be able to advise you about what these costs are likely to be. 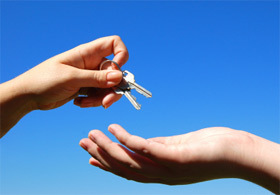 You can submit an offer on a property before the auction which, if suitable, would be sent on to the seller. If this is accepted then your purchase will go ahead and when contracts are exchanged the property will be withdrawn from the auction. This is by far the most exciting part of buying or selling a property at auction - but make sure you're prepared on the day. If you're buying, contact the auction centre beforehand to make sure that the property you want is still available. Buyers will need two forms of identification, (for example, a current passport and a utility bill), a copy of the auction catalogue, solicitor's details and a deposit - if you are successful then you will need to pay this when contracts are exchanged, which happens on the fall of the hammer. It's also a good idea to arrange for your buildings insurance policy to commence as soon as the hammer falls. For some leasehold properties this might not be necessary but your solicitor will advise you on this. This is payable upon exchange of contracts. Preferably by debit card, cheques will incur an extra fee. At some auctions there may also be a contract documentation fee payable, which is usually around £1,000 inclusive of VAT (£833.33 exc VAT). 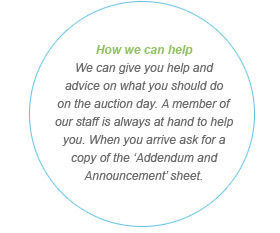 Before bidding begins, the auctioneer will check that everybody has a copy of the 'Addendum or Announcement' sheet and will read out any last minute alterations to the catalogue details. When the property you are interested in comes up, make sure you know the maximum price you can afford to pay - it's easy to get carried away! Once bidding begins, potential buyers will be asked to make their bids clearly either by raising their hand or a copy of the bidder's card. And don't worry... you can't accidentally buy a property just by scratching your head! Once a final bid has been put forward, the auctioneer will signal that it is about to be accepted by using the phrase 'going, going, gone' and bang the hammer to close the sale. If a property fails to reach the reserve price it will be withdrawn from the auction and the auctioneer will invite anyone still interested to talk afterwards. Sales can still be made afterwards if a price is agreed with the seller. If you can't attend on the day, then you can arrange for someone to submit bids on your behalf. They will need your written consent and need to bring along their own identity and address verification together with certified copies of your identity and address verification (for example, a current passport and a utility bill). You should also agree strict limits before any bids are submitted. If you would like someone from the auctions centre to do this, then contact them at least two days before the auction, to arrange completing and submitting the proxy forms. If you are not attending, we will require your ID and address verification. These must be certified by a professional person (such as a solicitor) if you are unable to meet a member of our staff in person before the auction. The certification must confirm the ID document is a true likeness of you and also a true copy of the original document. You can submit telephone bids to a member of the auction team who'll be in the auction room and bid for you via telephone link. The documents can be found in the auction catalogue. These documents must be submitted and acknowledged along with certified copies of your I.D at least 48 hours prior to auction day. Remember that if you can attend the sale yourself, then this is by far the best way to bid and you won't miss out on the exciting atmosphere in the room. Once the hammer falls, then contracts are legally exchanged. The contract will need to be signed and the deposit handed over immediately. The auctioneer is legally entitled to sign the contracts on behalf of the buyer and seller if necessary. The completion of the sale usually takes about 28 days, however for some properties this can happen sooner - this will be stated in either the general or special conditions of sale in the auction catalogue or as a special condition of sale in the legal documents. The balance of the sale price will be payable upon completion and a solicitor will normally deal with this part of the sale. There are many advantages to selling your home at an auction. It's quick and if successful the whole process can take as little as six weeks, there's no chain and when the hammer falls, your property is sold. Selling at auction also widens the potential market, not only will there be buyers who want to make it their home, there'll also be investors, developers and property dealers interested in buying. 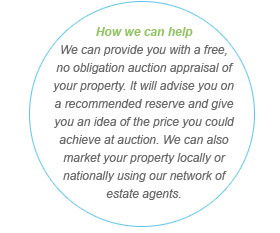 In many cases an auction could prove to be the best method for selling your property and not just a last resort. Once you've decided to sell, you will need a full auction appraisal to find out what price you can expect to achieve, the likely timescales and costs involved. You should choose your auctioneer carefully as this can make all the difference as to whether you achieve the best price. It may be tempting to go with the auctioneer who quotes you the highest guide price, but if your property doesn't sell then you could be left with the auctioneer's and solicitor's costs and a home that you still need to sell. It can also be tempting to use the auctioneer that quotes the lowest fee, but are they really going to market your property to its full potential and generate as much interest as possible before the auction? Just one extra bid on the day could more than cover a slightly higher fee. You will need to register your property at least six weeks before the auction to ensure that it is included in the catalogue and also allowing the auctioneer plenty of time to market it. A good auctioneer will market your home online, in the local or national press and distribute the catalogue to potential buyers and investors - all the time, keeping you fully updated on the response. 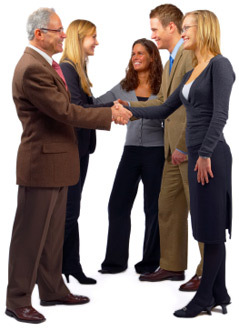 You'll also need to appoint a solicitor who will help in preparing the contract of sale and supporting legal paperwork. Again, a good auctioneer will liaise with your solicitor fully, ensuring everything is in place for the auction sale. Once the marketing of your property begins, the auctioneer may receive offers on it before the auction. If your property is sold before the auction, then it will be withdrawn upon exchange of contracts. A lot of people are put off from selling at auction because they're worried they will lose money if bids are very low. Don't worry, you should talk to your auctioneer about setting a reserve price which is the minimum price you want your home to be sold for. This is normally set in principle when you instruct the auctioneer. It safeguards you from setting a reserve that is too low or too high. It's confidential and will not be disclosed to anyone.